» You’ve gotta have personality. There’s a lot of subjectivity in what makes someone ‘good’ at social media. For instance, if you’re running a personal Twitter account that’s just for fun, it will look very different from an author who uses it both for personal updates and for marketing her own books and personal brand. Each of those two, in turn, will look different from a company or a non-profit account. Jax from 101.3 The Bounce. Photo by Stoo Metz. That said, one of the key elements of almost any successful social media presence is personality. What that personality looks like will be different for basically every account, much as it is with real live people, but the point is to have it. Whether you’re representing a fast food chain, a women’s charity, or yourself, your followers will ultimately stick around because they like you (or the ‘you’ they perceive through your posts). There are a lot of different ways to show your brand’s personality, but today I have one example. This was one of those times that I immediately thought, “Hey, she’s doing social media really well!” and I think we can all learn from it. Jax (at left) is a radio host here in Halifax who also happens to have a fantastic social media presence. 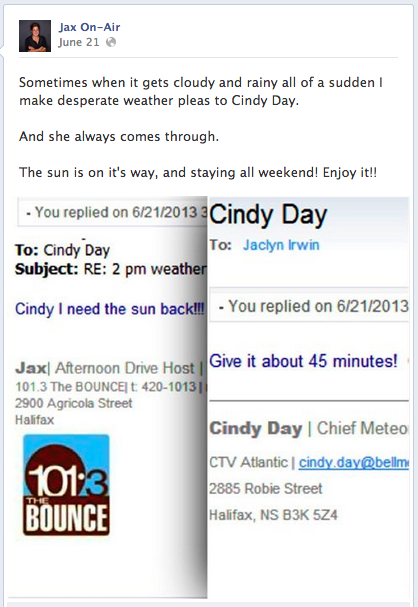 On a Friday afternoon back in June, the weather took a turn for the worse and she posted this email exchange (below right) with well-known local meteorologist and TV personality Cindy Day. It was funny (and had an element of nostalgia – but that’s a bonus). One of the best ways to engage people on social media is to get them laughing, and Jax did a great job of that here with her urgent plea to a meteorologist for more sun. The added nostalgia effect of Cindy Day’s long career in this city only added to the positive emotional association with this post. It was important to her followers – and to her. We’re not talking about vital-for-life kind of importance here, but on a Friday afternoon in late June the sun is pretty important to most people. Talk to people about something they care about, and you’ll immediately connect. The big one: it was attractive without being ‘on-message’. One of the biggest mistakes people tend to make with their social media presence is thinking that 100% of their posts need to be on-message. What Jax displays beautifully here is the idea that it’s okay to be off-topic sometimes, because ultimately it draws people in. It’s playing a long game; if you can seem like a real human being, even if your posts are sometimes seemingly unrelated to your particular message, then when you do have something important to say, people will be there to listen. We learn to tune out constant advertisement, but when we’ve engaged with someone we’re more likely to pay attention when they have something to say. 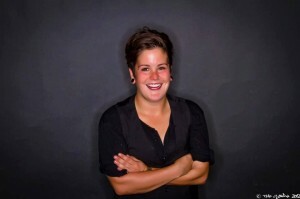 We can’t all email local celebrities in humourous ways to increase engagement on social media, of course, but we can take the concepts of humour, audience importance, and playing a long game of engagement to develop a more ‘human’ social media personality. Ultimately, it’s really just about acting like a person – which you have a lifetime of experience doing! Figure out how you can do that in the context of whatever brand you’re representing, and you’re golden.